End position of the first game I ever won. I was white; Black resigned. 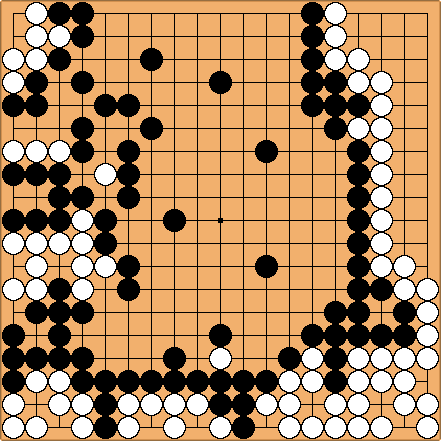 I have been playing go since September 2004. I am the organizer of the Louisville (Kentucky) Go Club. At the moment I am their president. I'm also the guy that b1tch3s about the aging component of KGS's rating algorithm every chance I get. I mean, I don't play for a couple weeks and my rating is 30K? again? What the heck is that all about? And don't bother explaining it to me because whatever excuse you have I don't buy it. I'm 34 years old, a father, and a working stiff with precious little time online. Why should I suffer? Grr. Every once in a while, I will play someone who is supposedly around my rank, and I will get utterly humiliated. I don't claim to be the greatest player in the world, but I know enough to know how a real 25-30 kyu player ought to play. I also know how a player 10-20 stones or stronger than I plays. Why anyone would do this is beyond me, but here is a list of people I think might be sandbaggers. I might be wrong. If I am, I will apologize and take off their name.